“There is no branch of detective science that is so important and so much neglected as the art of tracing footsteps”, simply stated by the fictional detective character, Sherlock Holmes, from “A Study in Scarlet” written in 1881. The shortest answer, it is extremely important to any crime scene investigation. I find the various types of impression evidence to be a fascinating study in crime scene investigation. This is the one area, with exception to the study of the psychological aspect of a criminal, which really piques my forensic interest. Impression evidence comparison is based upon the details of the particular object of interest that can be examined for distinctive and unique details. Various impression evidence left behind at a crime scene is similar to fingerprint evidence in that it is in two or three-dimensional form. 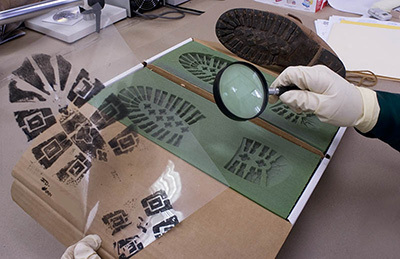 The most common types of pattern evidence found at a crime scene are footwear and tire track imprints and impressions. Footprints or tire tracks can lead investigators through the actual path that the criminal took, to finding secondary crime scenes, and even indicating the criminal’s height, or whether they were running or walking. It is imperative that the crime scene detective be attentive and mindful of not disturbing any of these types of important impression evidence so that each clue can be documented, collected, and preserved. What falls into the impression or pattern evidence category? Imprints are two-dimensional markings that have only length and width; they are usually made in residue, such as blood, dust or mud and can either be positive or negative markings. Impressions are three-dimensional markings that have length, width and depth. They are most commonly found in soil, sand, or snow and are negative markings. Seizure of a particular item (e.g. doors, window glass, sections of flooring, etc.) containing the imprint/impression. Photographing the imprint/impression at the scene utilizing special photographic and lighting techniques. Making a cast of the impression using various casting materials and methods (e.g., dental stone, plaster of paris, or paraffin wax). Lifting imprints using appropriate materials and equipment (e.g. rubber or adhesive lifters, Electrostatic Dust Lifter, fingerprint dusting powders, etc.). Enhancement of particular areas to develop latent or low quality imprints using various chemicals and alternate light sources. This entry was posted in Forensic and tagged author jennifer chase, crime novelist, forensic, forensic technology, impression evidence, thrillers. Bookmark the permalink.